Lars Anderson holds up a strand of pondweed during a tour of the Tahoe Keys last summer. 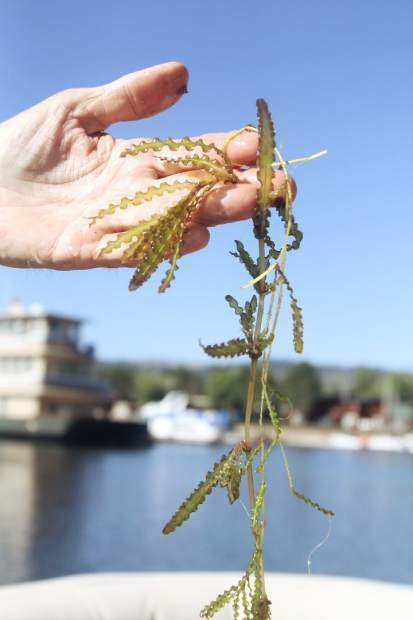 Pondweed and Eurasian milfoil, both non-native plants, choke portions of the Tahoe Keys' canals. SOUTH LAKE TAHOE — When the Tahoe Keys were created in the 1960s they became Lake Tahoe’s largest commercial marina. Opposition at the time argued that the project was a significant detriment to surrounding marshland. For boaters, however, the idea presented a network of crystal-clear water channels to accommodate their vessels and access the lake. It’s possible that no one could have foreseen that those warm, shallow channels would one day be home to Tahoe’s most dense population of invasive species. 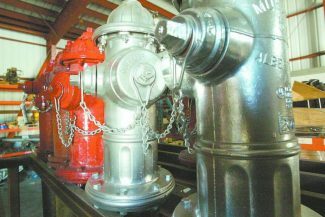 It is a concern that will continue to be addressed this summer as part of the multi-agency Integrated Management Plan led by the Tahoe Keys Property Owners Association. “[The Tahoe Keys] represent the largest source of [invasive] weeds for Lake Tahoe,” Tahoe Regional Planning Agency environmental specialist Dennis Zabaglo said during a presentation on the state of the lake at TRPA’s monthly board meeting Wednesday, April 27. “We are now looking at a much greater than 90 percent infestation of invasive weeds in the Tahoe Keys,” Sierra Ecosystems Associates president Rick Lind further explained during the presentation. His firm has been contracted by the property owners association to assess possible solutions. Two plant species, the Eurasian milfoil and curlyleaf pondweed, have expanded to a point where they have overwhelmed natural species in the area. The plants have also become home to non-native warm-water aquatic life including goldfish, catfish and bullfrogs. As part of the multi-year plan, the property association board authorized an additional $520,000 to fund continued research this summer. Researchers will study a number of approaches to weed management with the potential to implement practices in 2017. Plans include weed harvesting, the potential for limited use of herbicides within the Keys, as well as the possibility of incorporating an innovative new technique using UV light to kill plants. “We’re looking at several approaches,” University of California, Davis, scientist Lars Anderson said. A decision by the U.S. Environmental Protection Agency last September determined that some herbicides may be approved for use on a case-by-case basis in Lake Tahoe, making it a potential option in the Keys. Defending the possibility of herbicide use, Anderson said it’s something that has been done to manage invasive plants in lakes across the U.S. He also said that any of the chemicals under consideration would be used in low concentrations and each break down rapidly. “They have a half-life of a week or two,” he told the Tribune. To assess the use of herbicides, the research group will continue dye testing this summer in order to study water flow in and out of the Tahoe Keys. Dye will be dispersed near the Keys’ two lake-access points to determine how far water flows from the shoreline or into the marina. Last summer, dye testing was conducted in channels farther back in the Keys closer to the lagoon. Researchers found that water in those areas largely remained in place and did not show significant flow through the rest of the Keys. Herbicides will be tested on samples in containers on land this summer. Scientists plan to assess how the chemicals would disperse and what effect they would have on native plants if used. The group will also evaluate harvesting practices. 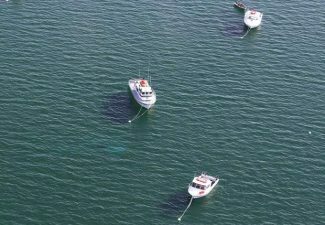 Aquatic weeds have been removed from the Keys since the mid 1980s, but studies suggest that the process creates fragments that can spread and expand plant growth. “We have some problems because they do create a lot of fragments,” Anderson said of current harvesting work. Between 13,400 and 18,600 cubic yards of weeds have been removed annually since 2011. “It’s clear the Keys are ground zero,” TRPA board chair Casey Beyer said during the presentation. The experimental UV plant treatments are expected to be field tested this summer, according to Anderson. “It looks really interesting,” he said of the new procedure. Specific plans they expect to implement will likely be determined later this year based on research results. The TRPA is conducting additional invasive species management outside of the Keys. No new invasive species have been found in the lake since the organization initiated boat inspections in 2007.